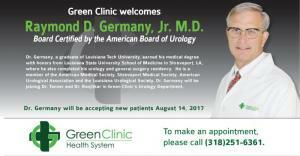 Green Clinic welcomes Board Certified Urologist, Dr. Raymond D. Germany, Jr. Dr. Germany is a graduate of Louisiana Tech University and earned his medical degree with honors from Louisiana State University School of Medicine in Shreveport, LA, where he also completed his urology and general surgery residency. He is a member of the American Medical Society, Shreveport Medical Society, American Urological Association and the Louisiana Urological Society. Dr. Germany has joined Dr. Tanner and Dr. Ranjitkar in Green Clinic's Urology Department at 1200 S. Farmerville Street in Ruston. To make an appointment, please call (318) 251-6361.